QR codes, those little black-and-white pixellated squares that can encode several thousand alphanumeric characters of information, lend themselves very well to both physical and virtual media. It’s common to see them in magazines and advertisements in meatspace, and since 2006 they’ve found their way into visual art, poetry collections, comics, currency, and even music videos. Now the QR-3D project, curated by Sally Fort, examines the integration of matrix bar codes into textiles: the codes are cross-stitched into samplers, quilted onto clothing, printed onto fabric, and knitted straight into a sweater. With their pixel-based formats, QR codes resemble two-color textile patterns of many varieties, which inspired Fort to challenge textile artists to combine high tech and artisanal craft. As long as the codes are worked in fairly high-contrast materials, they can be read by bar code scanners and camera phones. The codes frequently point to Websites related to the artists’ other work, but the possibilities are endless for tying physical objects to virtual content. Want to get involved? 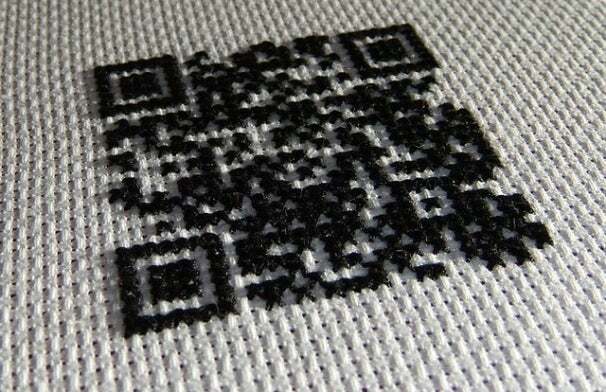 Submit your textile project to QR-3D, and discuss your ideas here in the comments!